Four bedrooms with double or queen size beds. The fourth bedroom has two queen size beds. Villa Tasca is located close to the historical centre of Palermo. Catania is 2 hours away, Taormina is 2 hours and 45 minutes, Siracusa is 2 hours and 45 minutes, Erice is 1 hour and 30 minutes and S. Vito lo Capo is 1 hour and 30 minutes. Villa Tasca is a luxury private villa available for hire on the beautiful island of Sicily. 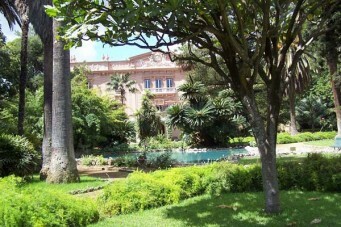 The villa is an 18th century mansion which is located right near the historical centre Palermo. It is owned by the Counts Tasca D’Almerita (owners of the renowned vineyards of Regaleali) and has only recently been turned into a “historical house” so people can discover the beautiful surroundings, rich in history and art. The interior decoration is magnificent with 18th century frescoes decorating the walls. Each room is different in colour, type, view and furnishings. The villa is fully staffed by 8 people and an assistant who is there to help you make reservations, tours and local visits. There are plenty of different activities and services that can be arranged such as massages, car hire, body guard service, guided tours, excursions to coastal villages, and winery visits. Guests to Villa Tasca also have access to the exclusive sailing club of Mondello beach resort. The weekly rate of the villa is the same all year round. It includes a maid service every day, and bi-weekly changes of linens and towels. Electricity, water and gas and cleaning are also all included. Telephone calls are extra. A chef is also included however the cost of food and beverages is extra. Villa Tasca is surrounded by a 10 hectare park, and is only a 10-15 minute drive from the beach. It is fully air-conditioned in all bedrooms, and WIFI and high speed internet is available. There are four guest bedrooms which all have queen or double sized beds – they are also equipped with mobile phone, internet access and hair dryers. On the island of Sicily there is plenty to see and do. Your assistant is there to help you book tours and activities such as diving, snorkeling, day excursions to coastal villages, massages, private car hire...the list goes on!